I am interested in the reproductive health of Indigenous Australians – the factors that influence the health of Indigenous babies as well as interventions to encourage healthy approaches for the long-term health of both mother and baby. Both my children were born prematurely so I have experienced first-hand the complications that can occur from a preterm birth. My daughter suffered significant health issues as a result of her early birth. This was been extremely challenging for myself and my family, but it made me consider how much more difficult it would be for people who are disadvantaged. The Indigenous community have a significantly greater rate of preterm birth in their communities. Combine this with lower socio-economics and remoteness from medical assistance and I could see how disadvantaged these babies can be before they have even entered the world. I was drawn to work with these communities to make a difference in improving birth outcomes and improving the health of the mother and their babies. To lower the rate of preterm births in the Indigenous community – healthy women having healthy babies for the long-term better health of the Indigenous community. Associate Professor Kym Rae began her career as a school teacher in Tamworth before pursuing an interest in reproductive health. Her PhD studies, completed in 2007 at the University of New England, examined the complexities of predicting the onset of labor. Employed by the Department of Rural Health, her work naturally progressed towards reducing premature and low birth weight deliveries in Indigenous communities. 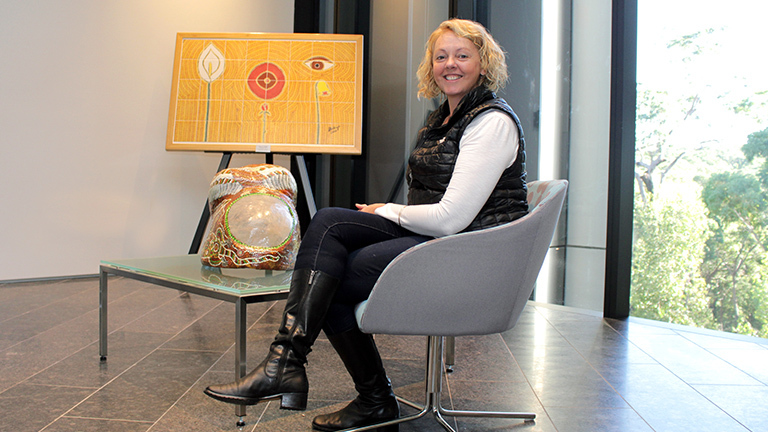 Associate Professor Rae has since been a driving force and Director for the University of Newcastle Gomeroi gaaynggal research and Arts-Health programs in Tamworth that engages Indigenous women during their pregnancy and beyond. Art sessions and doll making coincide with ongoing health education and checks where researchers monitor everything from mental health to cardiovascular and renal health. Mothers and babies are then followed up until the age of 5. Associate Professor Rae has mentored Indigenous staff involved in Gomeroi gaaynggal to enhance their research skills and return research capacity to disadvantaged communities. She has personally mentored five Indigenous women through to the successful completion of the Indigenous Research Capacity Building Cert IV. She has published over 70 conference and journal papers while being involved with grant funding exceeding $4 million. The Provider will implement the ‘Gomeroi Gayaanggal’ Project to provide a holistic approach to social and emotional wellbeing within the Indigenous communities of Tamworth and Walgett, and will add Taree and Forster in Stage 2. Funding to support the Gomeroi gaaynggal Community ArtsHealth running in Tamworth - covers art consumables which brings participants into the centre to participate in health screening and research being conducted. The Problem: In a recent study by CI Rae and Mah, the mental health of a cohort of Indigenous women during pregnancy showed extremely high rates of depression and anxiety in participants, with 31% of the cohort reporting evidence of these symptoms at least one visit during their pregnancy. Factors that enhance susceptibility to stress include personality traits, early life experiences and resilience. Gomeroi gaaynggal (GG) a research and ArtsHealth program based in Tamworth & Walgett, is working to improve the health outcomes for Aboriginal women and their children. In particular, 26% of their clients have evidence of underlying kidney disease. The ‘Gomeroi Gayaanggal’ Project to provide a holistic approach to social and emotional wellbeing within the Indigenous communities of Tamworth and Walgett, and will add Taree and Forster in Stage 2. Does a novel biomarker of renal function in pregnant Indigenous Australian women predict their future renal and cardiovascular health?